When I was in Library School (that’s what we called it back then) fine-art photographer William Wegman began exploring the world of picture books as a medium for sharing his doctored photographs of his weimaraner dogs. He staged fantabulous vignettes with his dogs acting out famous fairy tales (like Red Riding Hood, pictured, from his book Little Red Riding Hood) or engaged in everyday activities (like harvesting, also pictured, from his book Farm Days). The results were weird and fascinating and beautifully child-centered; while some adults found them creepy, kids were captivated. Wegman’s children’s literature output has been spottier of late, though experiments with a new style, inserting digital images of the dogs into scribbly, painterly paintings, have produced some recent charmers, including two board books out this month. 3…2…1…Circus! sees the dogs in all manner of circus scenarios, beginning with ten and counting down to a literal, lone puppy blast-off. Early Rider sets the puppies to get about in all manner of transportation, from pogo stick to hot-air balloon, described in rhyming couplets. The production values here are pleasantly rough, with sketchy objects on even sketchier backgrounds, offering a pronounced contrast to the digital clarity of the puppy pics. And Wegman’s ability to interpret the puppies’ playful positions, painting them into cockpits and clown suits, adds lots of dynamic energy. A successful board book speaks to its infant audience with color, content, and imagery. 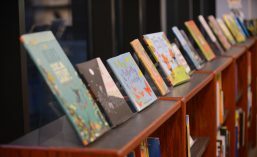 All too often we see popular picture books reformatted on board pages, to take advantage of some sort of classic status, forgetting that babies have special (literary) appetites. This pair does a great job combining raucous color, meaningful concepts, and adorable puppies into a chewable package just right for babies to devour. Here are a few book trailers from Wegman’s YouTube channel, because puppies. What’s little and round and needs to be read to every day? 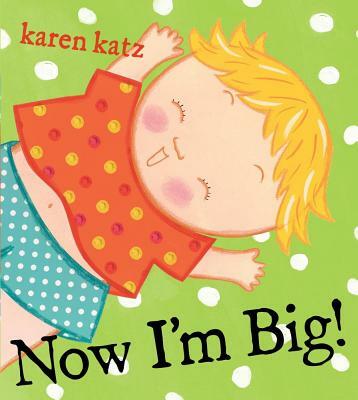 Karen Katz has dozens of bright, ebullient, irresistible board and picture books to her credit, all populated with her unmistakably round baby figures, in vivid, technicolor glory. This time around a collection of toddlers reminisce about their long-ago infancy. Each spread has a baby on the left suffering some baby indignity (When I was a baby I had to wear diapers) followed by the grown-up toddler celebrating new found preschool prowess (NOW I’M BIG! I can wear underpants and poo in the toilet). The final situation has a little girl welcoming a new baby to the family, offering a litany of all the ways she can help, now that she’s big. While toddlers will love feeling all grown-up, the bright colors, expressive faces and simple illustrative style make this a winner for the brand-newest little ones, too. In 2009 Templar Books created an exquisite board book of black and white fine art reproductions specially selected for babies’ taste for bold, high-contrast imagery. 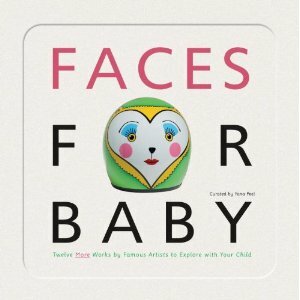 This follow up taps in to babies’ interest in faces, offering twelve modern depictions of the human face in varying styles. The composition is uncluttered, with nothing but the image, with the artist’s name and date of the work printed unobtrusively below. Brief biographical information of the artists represented appears on the verso and a circular mirror on the final page stands apart from the series of rectangular pieces, distinguishing baby’s face from the others. A luxe and lovely package. This charming, ingenious board book takes advantage of a deceptively simple die-cut process, making a matching game of farm animal parents and their young. 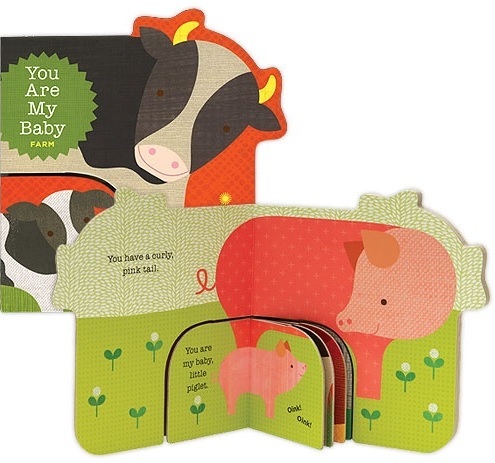 On each large page a grown-up farm animal describes her baby, complete with a color reference (You have a curly pink tail) and on the smaller pages the baby is pictured, identified by name, and the animal sound is communicated (You are my baby, little piglet. Oink! Oink!). The large and small pages turn independent of one another, though careful use of backgrounds that contrast in color and texture facilitates easy matching. With all sorts of developmental concepts at play (colors, patterns, animal names and sounds, matching, motor skills) this winning volume and it’s sister volume You Are My Baby: Safari fire on all baby cylinders. What are your favorite books for baby?